The Watermans Arms Pembroke. A good place to eat and to drink. Now it is illegal to smoke inside, this space will be used all the time. Sitting eating and drinking over massed swan faeces, with a very high coliform load. Note the weed killed Valerian under the parapet. Somebody should be sacked. 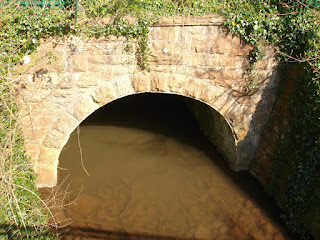 The Great Stench ,Pembroke Mill Pond. 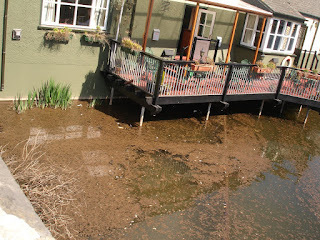 At this time of the year the Mill Pond stinks, the swans lavatory is overflowing, plants and animals die, Why? So that families can feed vast quantities of sliced white bread bought at Somerfields to the gross overpopulation of swans. 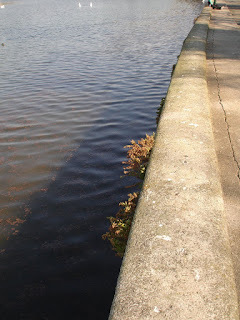 The plants, ferns, mosses and bryophytes growing on the wall at the edge of the Mill Pond have been killed by spraying. 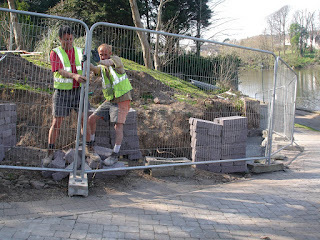 Which person gave the orders for this to be done.. Pembroke is an environmental, conservation, aesthetic disaster, every day it gets worse, I have far too many photographs to publish surely enough is enough. This wall being rebuilt is a continuation of the town wall adjacent to Barnards Tower. For many reasons it should have been rebuilt in limestone bonded by lime mortar, every body who has seen it do not want breeze blocks with a cement skim. Yet another example of Pembroke being short changed, and the wishes of local Citizens being ignored, why not demolish the lot and allow Govan Davies as South Haven to build another Trewent Park here? I am sure the "short back and sides brigade" would welcome it. Pay low council tax and get a very poor service. 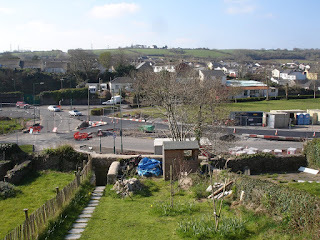 The mature trees have gone.They used to conceal the traffic, their large canopies absorbed the traffic noise, and the bends in the old road had a traffic calming effect. Councilor Brian Halls wasting public money again. This is an £800,000 "FLOOD PREVENTION SCHEME " note the new bridge is two feet higher than the one it replaces. WHY? The scheme depends on a computer to control the sluice gate at the Barrage to lower the water in the Castle Pond in anticipation of heavy rain fall. As specified it cannot work, we can expect worse flooding than before the scheme was started. Under the trees at the Green Pembroke. 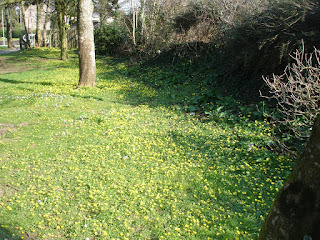 I asked the Grass Cutting Team if they could leave this area until the Celandines had flowered and set seed. This is the result, better than bare earth. 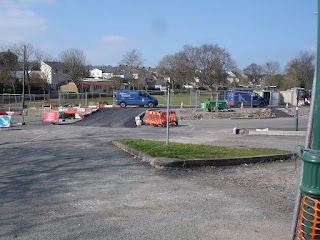 Why can't Pembrokeshire County Concil not manage their green areas in a more environmentaly sensitive manner instead of their "short back and sides" philosophy.